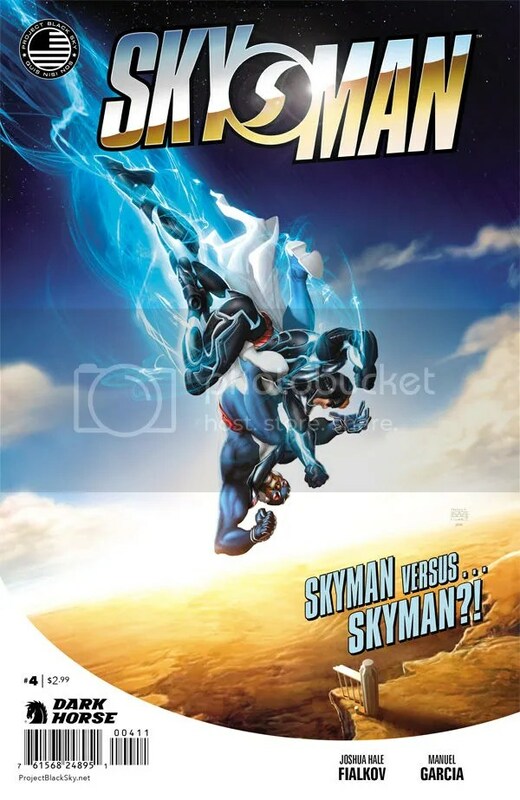 Fighting for his life thousands of feet above the ground, Skyman faces off against the people who made him a hero—and if he fails, he falls! Literally! They tried to make the perfect weapon, but they got a hero instead. And Skyman intends to act like one, even if it costs him his life! Picking up from the previous issue Eric and Captain Midnight are being attacked by Lt. Sharpe and a dozen other men, all in their own Skyman outfits. The next several pages are a lot of fighting in the sky, as Eric confronts Sharpe while Midnight handles most of the others. At this point, Sharpe seems to have gone over the deep end, he’s enraged and determined to kill Eric, even if it means that Sharpe dies too. Eric, while trying to protect himself and stop Sharpe, also has to deal with memories of the mission that handicapped, and where a squad of his men were killed. Eric is still racked with guilt about the mission, which Sharpe plays upon during their fight in order to increase Eric’s self-doubts. Can Eric overcome his doubts and prove that he deserves to be a hero, before it’s too late? Well…I don’t want to spoil too much, but I will say that the series ends with the possibility for future adventures of Eric as Skyman.